Chicken katsu is one of those dishes that doesn’t require complex preparation, but still manages to leave you craving for more. Basically, Chicken katsu is just a version of Japanese tonkatsu, with the only difference being the usage of chicken instead of pork. A traditional recipe for Chicken katsu requires boneless chicken breasts, breadcrumbs or panko, one beaten egg, flour, salt, and pepper to taste. In case that one would like to experiment, there is always space for adding different spices or mixing sesame with breadcrumbs. As this dish requires chicken to be fried, it is not quite compatible with healthy diet. However, it is usually served with with lots of vegetables and rice, which makes it all the more acceptable in everyday diet. 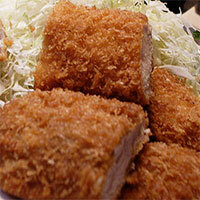 The calories in Chicken Katsu per 142.4g(1 piece) is 305 calories. Chicken Katsu is calculated to be 214Cal per 100 grams making 80Cal equivalent to 37.38g with 24.19g of mostly protein、17.44g of fat、10.21g of carbohydrates in 142.4g while being rich in vitamins and minerals such as Niacin and Vitamin K.